perhapablog... and other ramblings: farewell, mssr. holmes...! i said that i'd tell you more about the play, but of course, after reading fred's regalatory post from friday, you prob'ly don't wanna hear anymore about it from me. so i had fun! 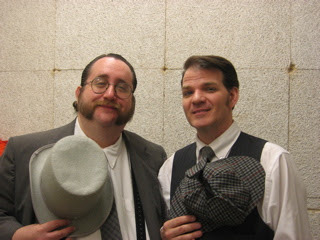 met lots of really nice people and felt that i did a fairly decent job of playing at sherlock holmes. 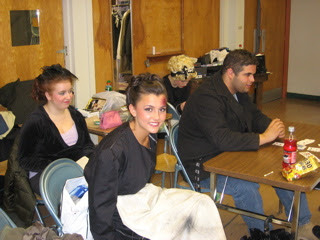 here are some of the cast backstage which was the only place i could really get any pictures~! i shang-hai'd my friend j.d. lewis into auditioning--and playing watson. not only is j.d. a great actor, he's a huge comics fan to boot! risa petrone played billye, holmes's young assistant/eyes-on-the-street, one of the famed baker street irregulars. unfortunately for risa (and stefan/moriarity, pictured below) they both fell victim to the lure of the perhapanauts and had each purchased the first blood trade in the first couple weeks of rehearsal. i comped 'em the second chances run. mary pasquale, renee credendino, emme knauss (in back) and nick capra. 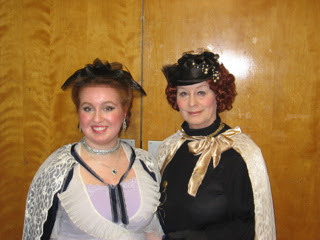 mary played lady edwina leighton, one of the upper class dames who hire holmes onto the case. (she and her partner, linda roper as countess von stalburg stole the show every night just before the final scene...) renee, here in one of her many costumes, played eliza forman, holmes's other assistant and spy in the house where bad things were happening. (renee and i had a lot of fun figuring out holmes's relationship with this now-grown baker street irregular...). emma was terese, the french maid. and nick played lightfoot mcteague, one of the thugs sent out by moriarity to do in the irritating detective. 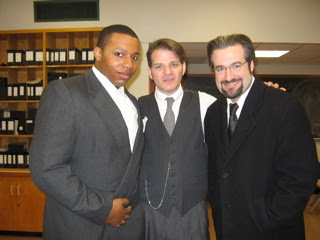 kevin edwards, me, and stefan bozydaj. 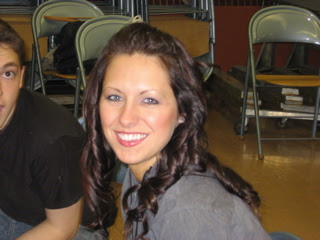 actually, the person that i had the MOST fun with--and totally adore--is this girl, jeanne! or as i like to call her, crazy jeanne. since we live near one another and about 45 minutes away from the school, jeanne and i carpooled and there were many times, much as i love theater, that i had a lot more fun coming or going to rehearsal 'cause of this chick! our senses of humor and levels of insanity are completely in sync and i hope you know how much i love ya! jeanne played leary, one of moriarity's crew and a spy for the devious professor. 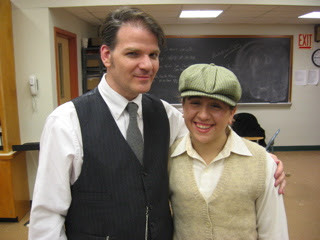 and this is me with steve press, the director. 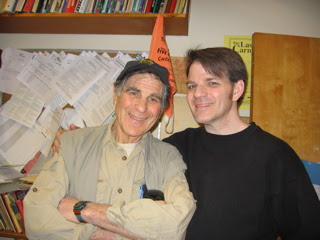 steve is my friend/teacher/mentor and way-back-when taught me more than i ever knew i knew. okay, that's enough about me and alla my stuff--wednesday we'll get back to a normal post with some more perhapa-centric stuff. Sounds like you had a great time Todd. Always nice to get a chance to stretch the creative muscles in another direction. You're no Leah Thompson, but I love ya anyway. Those picts look great! Looks like you guys all had a fun time!